I posted recently that I had something special coming up – Well my latest project is a Wedding dress. Needless to say this will be a design and make that I shall have to keep a little secret until the big day and final reveal, just in case the Groom-to-be stumbles across this! My client, Gemma, called round on Friday evening with her Mum, Aunty and Mother-in-Law-to-be to be measured up and to discuss what she wants. I also took the time to make a body form of Gemma (duct tape method) as she lives a fair way from me. The body form will let me get a good initial bodice fitting without too many visits. 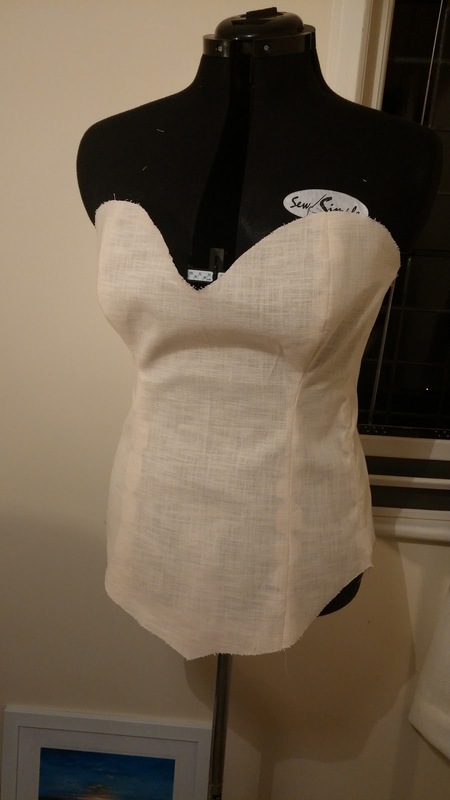 All I can say at this stage is the dress will have a boned bodice so I got to work and drafted a 9 piece bodice and knocked up the basic toile. I shall now have a play around with shaping etc. So far so good and I am happy with it at this early stage. The pattern was drafted based entirely from the measurements I took so should fit well. 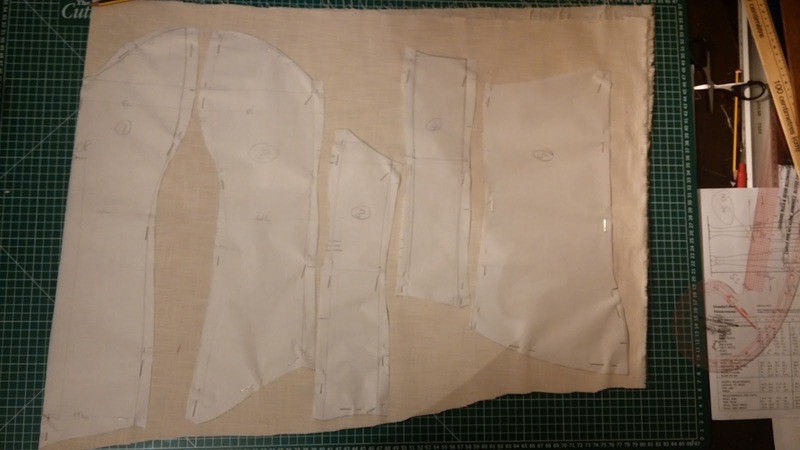 The bodice pattern pieces, ready for cutting. I will keep you updated, as much as I can so keep following to find out more. In other news, I have been working on a beautiful velvet jacket for a groom and will post photos after I have revealed it to him. The problem is that every time I make a jacket I want to make another….So I will be. Like my shirt tutorial that gets so many hits, I shall be doing a tailored Jacket tutorial for you. I shall be making a Jacket based on the Neapolitan style: Soft shouldered, minimally structured, rounded patch pockets and the traditional set-in puckered sleeve heads. So hopefully a tutorial you will like. Looking forward to the jacket tutorial. The duct tape method I have not tired this, but have scene it done. It is very effective at getting an exact body blueprint of your client. It looks funny once your done before cutting down the center back of all that tape. Thanks Corey, Yes poor Gemma did look rather strange wrapped up. I thought it best not to post photos of that part!